A single authentic diamond is set at the center of this beautifully-made solitaire heart ring crafted in solid 14k yellow gold. This ring is also available in 14k white gold or sterling silver (shown below). Available in women's sizes 5 - 9 (including half sizes). All heart rings from Apples of Gold Jewelry include free shipping & our 45-day signature no-questions-asked return policy. That way you are sure to get jewelry that you will love! 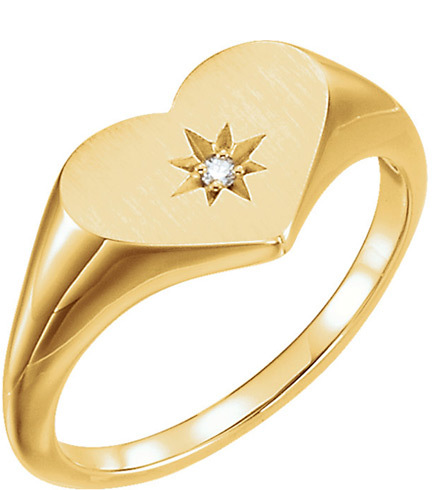 We guarantee our Single Diamond Heart Ring, 14K Yellow Gold to be high quality, authentic jewelry, as described above.